A big bamboo with olive green stems and alternate yellow striping. This fantastic bamboo is quite rare in cultivation. 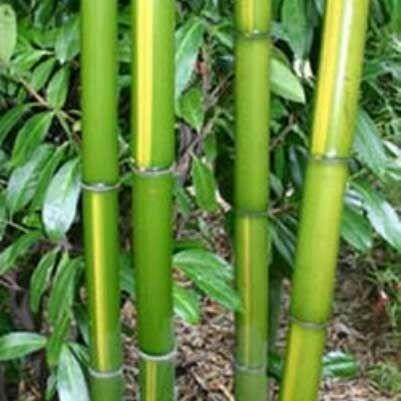 The large diameter culms, are striped erratically and spectacularly with yellow and make this one of the most impressive of all hardy bamboo. It's a biggie, getting to around 8m (25ft) in perfect conditions (usually smaller), with luscious large green leaves that contrast superbly with the thick canes. Specimen plant supplied at with several thick canes around 2-3 metre tall, in approx 20 litre containers.